Blackhawks gearing up for a trade? Tuesday afternoon, the Blackhawks placed aging defenseman Rob Scuderi on waivers with the intention of sending him down to Rockford of the AHL. The move cleared roughly $950,000 from the Blackhawks’ salary cap, which is quite important as we near the NHL’s trade deadline. Many view this move as a precursor to another move that Stan Bowman may have in the works, and by that I mean a trade. As we’ve discussed on here a couple of times already, the Blackhawks would really like to add a left winger who can play on the team’s first line with Jonathan Toews and Marian Hossa. They would also like to, if possible, add a top four defenseman to the roster. None of that can happen without first opening up some cap space. Byan Bickell and his $4 million cap hit were demoted to Rockford a while back, saving the Hawks $950,000 in cap space. Add in Scuderi, and that’s over $1.5 million that has already been cleared from the team’s salary cap. According to capfriendly.com, the Hawks should have about $3.4 million in cap space on February 29th, the day of the trade deadline. Something else to watch out for is the possibility of the Blackhawks placing Marcus Kruger on long term injured reserve (LTIR). Kruger inured his wrist back in early December and had to have surgery to repair the injury. He was expected to miss four months at the time of the surgery, and it looks like he is still looking at the same timeline. If the Hawks feel Kruger will be out until April, which is possible, they may elect to place him on LTIR. This would essentially remove his cap hit from the team’s salary cap (just like they did with Kane last year around this time), opening up another $1.5 million. If that happens, the Hawks would then have approximately $4.9 million in cap space that they could then turn around and use on a player, or players, in a trade. While no one wants to see Kruger remain out of the lineup, this is probably the smartest thing that the Hawks could do right now assuming Kruger is back and healthy for the playoffs. Placing him on LTIR would greatly improve the team’s ability to land a top left winger and/or defenseman at the trade deadline. I won’t get into too much detail again about specific names the Blackhawks may/should target (you can read that [here]), but guys like Andrew Ladd, Mikkel Boedker, and a couple others are likely going to be shopped by their current teams, and the Hawks would be wise to inquire about them. We’re just twelve days away from February 29th, but that doesn’t mean nothing will happen between now and then. All eyes are on Stan Bowman. Trade possibility for the Blackhawks? The Blackhawks are a good team. They are not great and nor are they bad, but just good. Unfortunately for them being good is not enough to accomplish much in today’s NHL. To do something like win the conference or win the Stanley Cup, you need to be an elite team, which is nothing the Blackhawks are unfamiliar with. The tough part for them is that they are so tight against the salary cap due to big contracts for players like Kane and Toews that it is nearly impossible to be elite year after year. The cap will not allow it. Without question one of the single biggest reasons why the Blackhawks have won three of the last six Stanley Cups is because of the depth that they had on those three rosters. Look no further than last year’s team. Their third line for much of the postseason, including the Stanley Cup Final, was Sharp-Vermette-Teravainen. That would be a lot of teams’ first or second line. The Hawks’ fourth line for last year’s Cup run was Shaw-Kruger-Desjardins, and while that may not seem great on paper, those three created incredible chemistry and played a huge role in winning the Cup. My point being, if you cannot role four effective lines in today’s NHL, you will not win much. Today’s Blackhawks cannot effectively role four lines, or at least not consistently, thanks to the league salary cap. And truthfully, this is nothing we should not have expected after the roster changes that needed to be made over the summer. However, there may be a sliver of hope developing that the Hawks can upgrade their roster between now and the trade deadline in late February. Marcus Kruger was recently placed in Injured Reserve for a wrist injury. David Rundblad was just placed on waivers and is off the NHL roster. That gives the Hawks about $1 million in cap space as of right now. If they were to hypothetically send someone like Rob Scuderi down to Rockford in the future, they would then have right around $3 million in salary cap space. That kind leeway with the salary cap can be extremely valuable come the trade deadline, much like we saw last year when the Hawks acquired Vermette, Timonen, and Desjardins after Kane went on LTIR. Now I’m not saying that Stan Bowman and the front office will for sure make a trade, but it is definitely possible. If the Hawks were to put Kruger on LTIR, making him done for the regular season, they could replicate what they did last year with the Kane injury situation and trade for a player or two, maximize their cap, and have Kruger return for the playoffs without his cap hit having an affect on the team cap heading into the postseason. It worked perfectly last year with Vermette and company, and if they Hawks can pull it off again this year, it may put them back into Cup contention. So let’s say that everything I said regarding Kruger going on LTIR, Scuderi being sent to Rockford, and so on does happen. Who might the Hawks target via trades? One name that I am seeing tossed around on Twitter and various other locations is Mikkel Boedker of the Coyotes. Boedker’s cap hit is $3.75 million this year, and he becomes a free agent in the summer. The sniper leads the Coyotes with 29 points so far this season, is fast, and plays left wing. 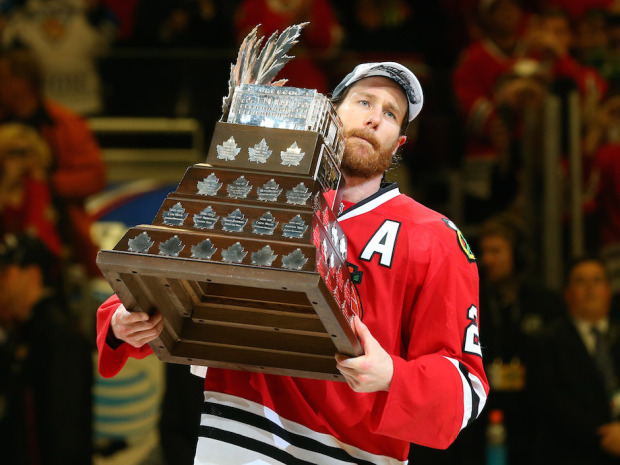 What is one of the Blackhawks’ biggest problems right now? Finding a first line left winger to play alongside Jonathan Toews and Marian Hossa. As it stands at the moment, Andrew Shaw is the one filling that role on the top line with Toews and Hossa. Shaw is by no means a first line player and instead belongs on the fourth line like he was during last year’s playoffs. Acquiring Boedker would create an absolutely lethal top line, and it would allow Quenneville to place Shaw on the correct line, whether that is the third or fourth. That right there adds some valuable depth to the Hawks’ group of forwards. Getting Boedker would require a valuable asset going the other way, and maybe even a player from the NHL roster, but it would be worth it. You also have to consider that Arizona currently sits second in the Pacific division, and they may be unwilling to trade away their top point producer while occupying a playoff position. Acquiring Boedker alone would not solve the Hawks, however. They could still use another defenseman and maybe even another third line center or wing. Actually being able to pull that off will not be easy and likely would not happen, but it is something I am sure Bowman will look into. Keep in mind this is all an idea at the moment based off of some rumors and conversations I have read online. At the same time though, it is realistic to think a deal like the one for Boedker could take place due to the Hawks’ ability to open up cap space with roster moves. Seeing as how Kruger was placed on IR and Rundblad was waived all within the past 24 hours, we may (or may not) see a trade take place sooner than later. Monday night the Blackhawks traded Trevor Daley to the Pittsburgh Penguins in exchange for fellow defenseman Rob Scuderi. Daley was acquired by the Hawks over the summer in the Patrick Sharp trade that sent him and Stephen Johns to Dallas. The hope was that Daley, an offensive defenseman, would be able to adapt to the Hawks’ defense-first style, but still be effective in the puck moving, fast-paced game that the Blackhawks like to play. Unfortunately for both sides, this was never a good fit. Keep in mind that prior to joining the Blackhawks, Daley had spent his entire ten year career with the Stars and in a system that never put much emphasis on being a defensive d-man. He was used to being offensive-minded, and asking him to change his ways on a dime after years of playing one specific style proved to be too big of a challenge. As anyone knows who follows the Blackhawks closely, Joel Quenneville does not tolerate players who are a liability on the defensive end. Hence the reason why he has been relatively reluctant to play rookies big minutes over the years. In the case of Trevor Daley, he was one of the weaker defensemen on the roster and simply was not gelling well with the Blackhawks’ style of play. In other words, a nightmare scenario for Daley, thus the reason for his trade. What is confusing about all of this, however, is the fact that the Blackhawks knew what they were getting when they traded for Daley. They knew he was an offense-first kind of player who had never played in a system like the one Quenneville runs here in Chicago, yet they still brought him in via the Sharp trade. Maybe the hope was that he could learn the Blackhawks’ style while still incorporating his offensive instincts when appropriate. Whatever the case was, it did not work out as planned. In return for Daley, Stan Bowman got Rob Scuderi from the Penguins. Scuderi is almost 37 years old and has spent most of his career with the Penguins. He won the 2009 Stanley Cup with Pittsburgh and the 2012 Cup with Los Angeles before returning to the Penguins for the 2013-14 season. To make this simple, we will just say that Scuderi is not good. He seemed almost like an untradeable player until Monday night because of the fact that no one would seemingly want him. He is slow, he’s not a puck-moving defenseman, and he is one of the worst defensemen in the league in terms of puck possession. He has always been more of a defense-first player, which is good for the Hawks, but that only means something if you can actually execute that style of play in an effective manner. So why then did the Hawks get him in return for Daley? Well, likely because the Penguins agreed to hang onto one-third of Scuderi’s salary. Because of that, the Blackhawks are opening up about $1 million in cap space, which may not seem like a lot, but actually can be when needing to make a transaction later in the season. Scuderi still has one year left on his contract, and it would be flat out wrong for the Hawks keep him in their plans for a whole new season after this one. What they choose to do with him both now and next year remains to be seen. In terms of the right here and now, they may plug him into the third d-pairing with Michal Rozsival and let him play there until they feel one of the young guns like Gustafsson, Pokka, or Svedberg can handle a full-time defensive role at the NHL level. If a guy like Gustafsson can develop a bit more in Rockford and proceed to return to the NHL during the second half of the season, in time for the playoffs, that would be the ideal scenario for the Hawks. They could then waive Scuderi and place him in the AHL. It is also not out of the question that Bowman could take advantage of the extra cap space cleared in this trade and try to acquire another defenseman at the trade deadline. One thing is for certain here, and that’s that no one should expect much of anything from Rob Scuderi other than a good locker room and veteran presence. The Hawks actually got a bit worse on Monday, and hopefully it won’t last too long. The Blackhawks have announced that Duncan Keith will miss 4-6 weeks following surgery to repair “a right knee meniscal tear.” It is unknown when or how the injury occurred, as Keith didn’t miss a shift in the Hawks’ last game against Columbus. Keith is the one player this team could not afford to lose for any lengthy time. Defense has been the Blackhawks’ biggest problem early on this season as expected. Their blue line was already thin with Keith in the lineup. Now with him gone, they’ll have to play van Riemskyk, Svedberg, AND Rundblad. They may choose to recall Ville Pokka in addition. It had been reported that Stan Bowman was on the hunt for a defenseman to acquire via a trade over the last couple weeks. With news of Keith’s injury, one would have to believe that Bowman is now pursuing a trade much more aggressively. With Keith likely headed to LTIR (Long Term Injured Reserve), that will open up over $5.5 million in cap space for the Hawks while he’s out. That’s more than enough space for them to add a contract to the roster in the form of a defenseman. The problem is that when Keith comes back, his contract will go back to counting towards the Hawks’ cap hit, which would make trading for someone now a future problem. They aren’t going to trade for a player who has any kind of hefty salary, as that would force them to dump salary yet again in another six weeks. So, given that information and the situation the Hawks are now faced with, I’d be surprised if they pulled off any significant trade. I think it’s much more likely for them to go ahead and sign a free agent veteran defenseman, like Lubomir Visnovsky who was cut by the Hawks before the season began. He didn’t look bad at all in camp and would be a cheap addition. All in all here, this is horrible news for the Hawks. Keith is the one guy they couldn’t lose, and now he’s gone for 4-6 weeks. Playing in the Western Conference was already going to be tough enough, and now the Hawks will have to do it without their top d-man. The Blackhawks and Brent Seabrook have agreed on an eight-year contract extension worth roughly $6.85 million per year. Seabrook will be entering his eleventh season in the NHL, all with the Blackhawks. During his ten years as a Hawk so far, Seabrook has become one of the “core” members of the franchise while winning three Stanley Cups. He is regarded as one of the league’s better defensive defenseman, and can also light the lamp with his booming slap shot. His season high goal total thus far is 9 (three times), but you can expect 30-40 points from Seabrook each year. While his numbers for a defenseman are pretty good, his intangible contributions are what make him as important as he is. He has always been considered one of the most prominent leaders on the team, despite ever being named a team captain. That changed recently, however, as Seabrook was elected by coach Joel Quenneville to be a new alternate captain given Patrick Sharp’s departure this past summer. 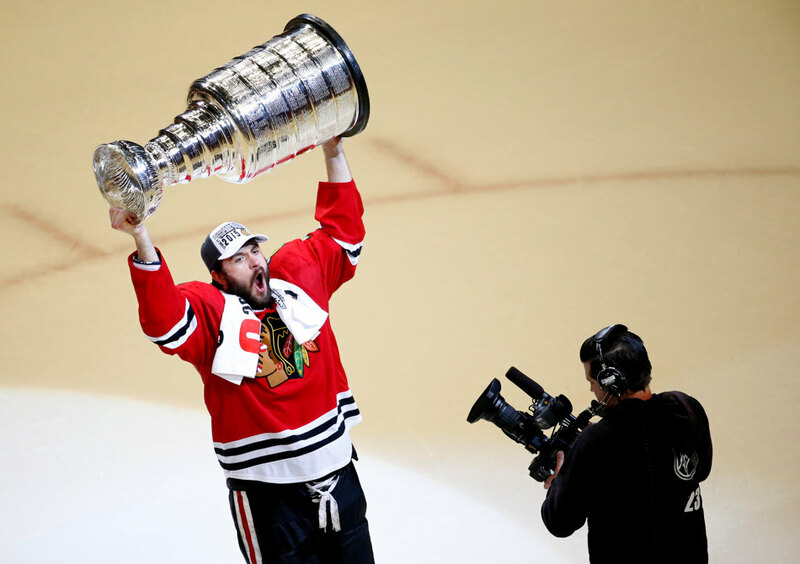 Seabrook has always been deserving of that title, and now he finally has it. Along with his natural leadership abilities, Seabrook has come up with a countless number of clutch goals over the course of his career. From his Game 7 overtime winner against Detroit, to his overtime winner in Game 4 of the Cup Final against Boston, to his goal in triple overtime against Nashville this past postseason, and so many more, Seabrook has consistently come up big for the Hawks when needed. He has always seemed to elevate his game as the stage gets bigger and the lights turn brighter. When his time with the Blackhawks is all said and done with, he’ll definitely have a case to one day get his number retired by the organization. The only glitch with that is the fact that a certain Chris Chelios also wore number 7 with the Hawks. If Seabs gets his number retired, Chelios will have to then as well. All in all, this is a good deal for both sides involved. Seabrook is getting a nice raise (he will be making more per year than Duncan Keith when this new deal kicks in next season), and this will ultimately become a team-friendly deal as time progresses and the league salary cap eventually rises.